An interesting scarp-line extends from the San Andreas fault near Gorman to Searles Dry Lake located southwest of Death Valley. This lesser-known Garlock Fault has within its reach some interesting history related to the discovery of gold. And, where there’s gold there has to be a story worth telling. John Goler entered California by way of Death Valley. This short-cut to the gold fields of California proved disastrous for most of those who chose it. Goler’s trip was no exception. According to his story, as told by others, after days of travel across mountains and down dry valleys, delirious and dehydrated, he stumbled on a spring of fresh water. While resting and recuperating from his unimaginable Death Valley adventure he looked down at his bare feet. And, as often happens with desert yarns, an unsuspecting sufferer was rewarded with a gold nugget winking between his toes. Goler went on to settle in Los Angeles and became a prominent member of the community operating a profitable foundry. Eventually, he returned to the El Paso Mountains where he believed the spring to be located but is unable to find it. A canyon in that range carries his name to this day. The first lode mine, in the El Paso Mountains, opened in the mid ‘50s and proved to be successful. Others followed. From that early time, prospectors combed the peaks and canyons of this range looking for a promising outcrop. But the real find wasn’t made until the early 1890s when a chunk of placer gold weighing 56 troy ounces was found at some depth in a wash below one of the south facing canyons. In no time, dry washes and banks of gulches filled with men and contraptions designed to sift through sand and gravel for the elusive metal. 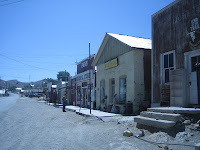 The settlement of Garlock provided boarding houses, saloons and a few stores to serve the growing placer camps. 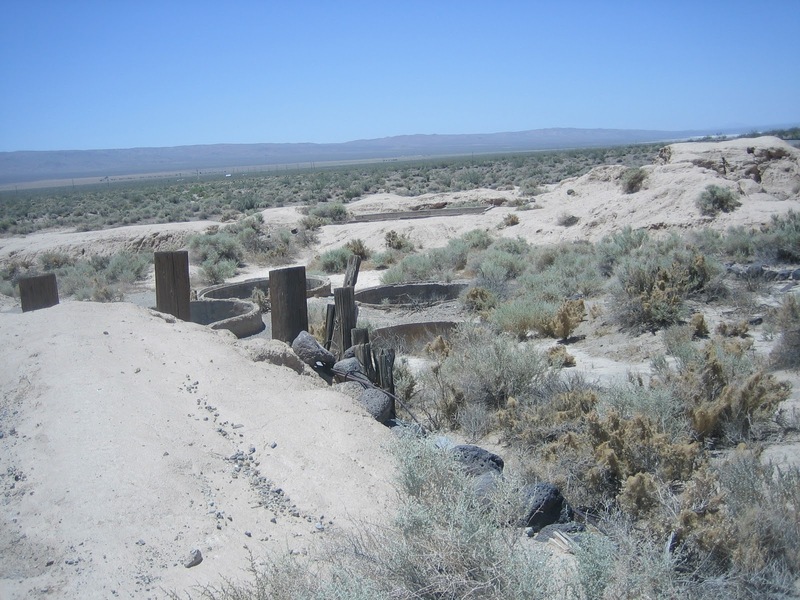 It had started as a watering hole for cattle trailed from the High Sierras to the warmer winter range on the desert. The place got its name from Eugene Garlock who established a gold mill there to take advantage of the water. Fredrick Mitchell Mooers described as tall, lean, bearded and well educated, left his position with a Los Angeles newspaper and joined the rush to Golar Canyon. By the time he arrived, the good pickings had been claimed forcing him along with other late arrivers to work the gravels farther out where four dollars a day of hard work was an average take. Born in Ithaca New York in 1847, Mooers spent his early adult years as an accountant for a large drug company headquartered in the Manhattan district of New York City. He married and eventually became manager of the Brooklyn Eagle newspaper. Mooers claimed to have studied geology and eagerly discussed with his partner the likelihood that the small range of hills ten miles to the south might have gold bearing ore. Placer work had stopped because, as we know, wet gravel can’t be dry washed. And, the rains that spring would likely keep the washes unworkable until June according to old timers. Mooers and his partner John Singleton ask Charlie Burcham to join them because Charlie had a team and wagon that they would need to haul supplies to the site. He agreed to join if they would pay for the hay that his mules would need. Over the next few days, they quietly gathered “picks, shovels, drills, powder, mortar and pestle, horn spoon” and rations. To throw off suspicion, they told their placer mining neighbors that they were quitting and returning to San Bernardino. The three made camp and started prospecting in the area that Mooers had marked. A large quartz outcrop “unbelievably rich and six feet wide” stood at the head of a canyon. The top of the ledge had decomposed to gravel and flakes of gold that could be recovered in a dry washer. They badly needed money to pay for a survey of their claims before word of the discovery got out. Mooers and Singleton stayed to protect and marked the boundary while Burcham took his team to San Bernardino where he recorded the claims. They named their mine “Yellow Aster”. Fortune smiled when O.B. Stanton an investor, and his mining engineer, a man named Brown, rode into camp. After inspecting the ledge Stanton made a generous offer to option the property and to construct a mill. Mooers and Singleton, tired and hungry for success, signed an agreement and promised that they would get Burcham to sign when he got back. Burcham, unaware of the deal, told his wife about their discovery and signed over half of his one-third interest to her. When he arrived back at the camp the partners joyfully told him about the offer and he agreed but told them that he had given his wife half of his interest. Dr. Rose La Monte Burcham got her training at the Medical Institute of Cincinnati and came to California to practice. She married Charlie Burcham, a cattle rancher, and they took residence in the city of San Bernardino. In a word, she refused to sign the agreement to sell her one-sixth interest – Stanton would have to look elsewhere. As it turns out, the three original partners owed their fortune to Dr. Rose who took management of the mines, put a lock on the bank account, fought numerous law suits that arose and gave union bosses a good licking. When the infamous one-arm mining attorney Pat Reddy tried to horn in on the property, she quietly filed incorporation papers forcing Reddy to settle for a few shares of stock in the new company. He swore to friends that he hoped to never again deal with the like of that woman. At first, ore from the original shafts and tunnels was shipped to the Garlock Mill for processing. Later, two mills with a total of 100 stamps were completed on the property and by the end of ‘98 the company was paying substantial dividends to investors. The mines continued to produce returns until 1917. Randsburg would have been a hard place to describe. Tents and simple wood framed houses dotted the hillsides with no sense of order. Business activities crowded both sides of Butte Street where business lots sold for outrageous prices. As new mines opened, the population grew. A railroad constructed from the Santa Fe line at Kramer eventually reached as far north as Johannesburg and was active until competition from a Southern Pacific line to the north caused it to discontinue service. Fights, shootings and rowdy behavior was tolerated until a gang called the Dirty Dozen took over the town. The position of constables had no takers which meant that there was no one to enforce the law until the mine owners got together and hired Tex Lovett. Lovett, like most lawmen, never spoke above a whisper and went quietly about the business of rounding up gang members one by one and hauling them before the court. The local postmaster who was also justice-of-the-peace supported Lovett’s effort and ordered the culprits to leave town that day with warning that if they returned they could become the subject of a hanging. The purge was a success. The three partners built sizable homes in the town but spent most of their time traveling and investing their fortunes in other places including the city of Los Angeles and San Bernardino County. Mooers liked his whisky straight and spent time in local taverns. One afternoon he got into a heated argument with his driver over some minor disagreement. When the argument got beyond words, Mooers gave the man a shove causing him to fall back and strike his head on a large silver spittoon. His death was ruled an accident. Most deaths by knife, bullet or fist were ruled either self defense or an accident. Mooers family and friends had not heard from him for twenty years and had no ideal where he had finally settled. When news of the Yellow Aster bonanzas reached the East Coast his name took space in every newspaper in the state of New York. Upon that news, his wife acquired a divorce and one million shares of Yellow Aster stock. He bought a stylish Victorian house in Los Angels in hopes of winning the return of his wife but she would have nothing to do with him or the house. Disheartened by her refusal, he returned to New York in 1899 and died of heart failure in 1900 at the age of 52. “Mooers House” is located at 818 South Bonnie Brae, Los Angeles. It has been described as a good example of “eclectic” architecture and has gained local recognition as a historical monument. We visited and photographed the house a few months ago. Randsburg remains a living relict of an early 20th Century mining town and a “must visit” for anyone interested in the California Desert. The few remains of Garlock, are well protected behind chain link fences. The site is located on Randsburg Road at Google Earth.35 24.100; 117 47.431. 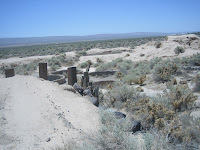 A friend and I found some cyanide vats that were used in the 1930 to process mine tailings from the Garlock Mill. They are located across the railroad tracks from the Garlock site.